Dracula (Adam Sandler) is back in Hotel Transylvania 3, the latest film in director Genndy Tartakovsky’s animated series. The result is an amusing threequel that shows there is still some fun to be had with these characters, and if you liked the first two, then you are sure to get at least some enjoyment out of it. This time around, Dracula is feeling lonely and stressed out, never getting a break from his work at the hotel. So, sensing that her father needs a vacation, his daughter Mavis (Selena Gomez) organizes a family trip aboard a monster cruise ship, so that he can spend some quality time with his grandson Dennis (Asher Blinkoff). They are joined on the trip by a variety of other monsters, including Dracula’s father Vlad (Mel Brooks); the wolfman Wayne (Steve Buscemi) and his wife Wanda (Molly Shannon), who are exhausted from looking after their ever increasing litter of pups and in need their own vacation; Frankenstein (Kevin James) and his bride Eunice (Fran Drescher); the invisible man Griffin (David Spade); the mummy Murray (Keegan-Michael Key); and the gelatinous green Blobby (Tartakovsky). But the trip gets overshadowed when Dracula falls for the ship’s captain, Ericka (Kathryn Hahn), and almost instantly “zings” with her. Things are complicated by the fact that she is not only a human, but also the granddaughter of his arch-enemy Abraham Van Helsing (Jim Gaffigan), who has been trying to kill him unsuccessfully for at least a century, and unbeknownst to them is secretly running the ship. While Hotel Transylvania 3 lacks some of the freshness of the first one, which remains the best in the series, the film more than makes up for it with a manic pace that is constantly delivering amusing visual gags and witty one-liners. The story is also kind of sweet in its own way, and has an underlying message about fighting prejudice that is quite welcome, with the relationship between Dracula and Ericka nicely mirroring the first film’s love story between Mavis and her human husband Johnny (Andy Samberg), whom Dracula initially struggled to accept but is now seen as part of the family. Like the first two, Hotel Transylvania 3 is also worth seeing for the appealingly stylized animation, with Tartakovsky once again embracing a more cartoony style that makes it stand out from the majority of more realistic animated films, allowing him to showcase a variety of character designs that range from cute to grotesque. This all adds up to an enjoyable animated film that is kept entertaining thanks to likeable characters, an offbeat sensibility, and fun performances from the voice cast. The Blu-ray also includes a commentary track featuring Tartakovsky, the two mini-movies Puppy! and Goodnight Mr. Foot, the featurettes Behind the Screams: The Voices of Hotel Transylvania 3, Meet the New Characters and Johnny’s Home Movies, as well as lyric videos and several “Scary-Oke” sing alongs, and a selection of videos outlining some monster activity ideas. 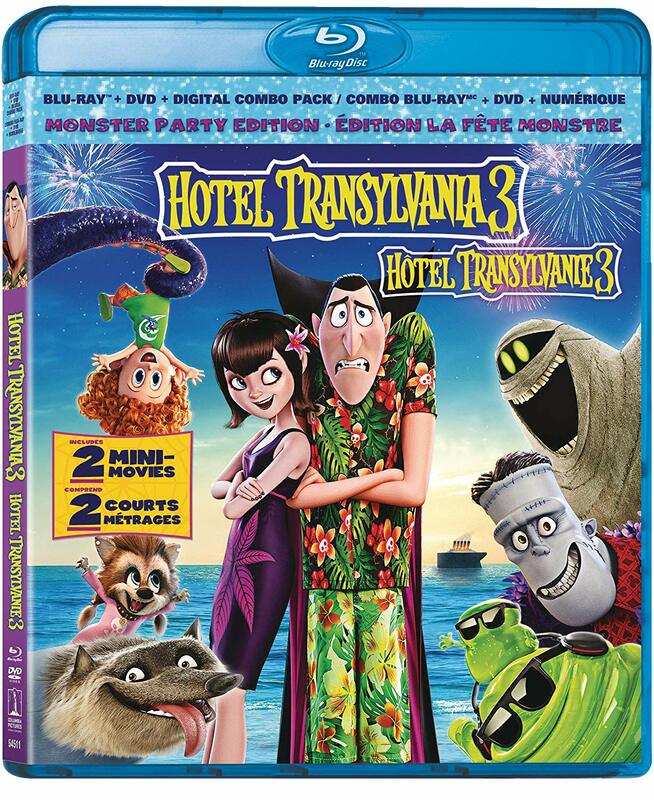 Hotel Transylvania 3 is a Sony Pictures Home Entertainment release. It’s 97 minutes and rated G.